I stumbled upon this recipe when I watched this video titled, “Restoring Gut Health After Antibiotic Use”. 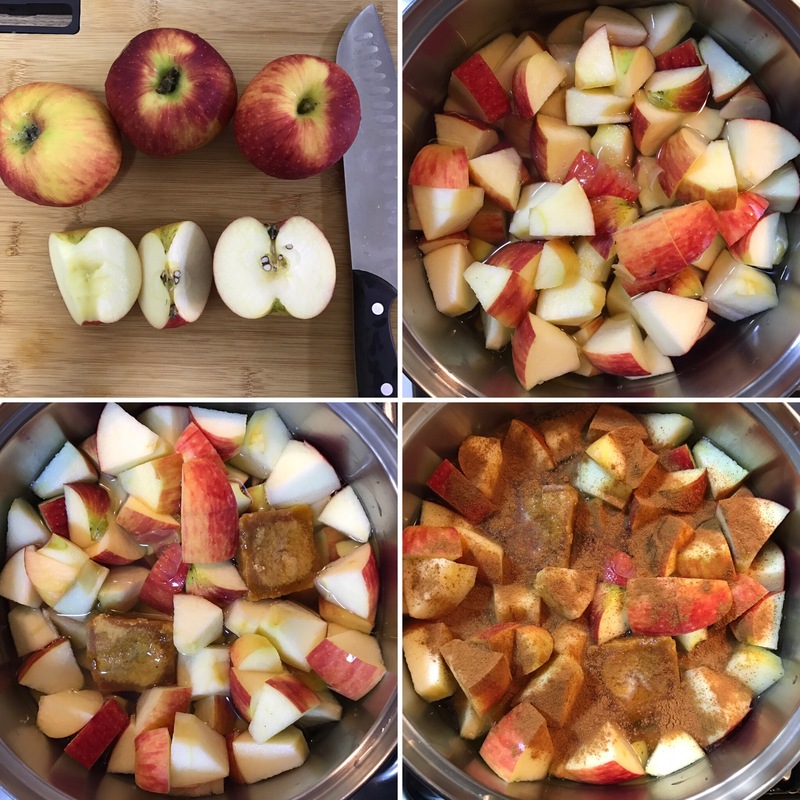 In it Dr.Tom O’Bryan explains how the good old Apple Stew or Apple Sauce (as they call it in the US) has great potential for healing leaky gut and feeding the good bacteria in our intestinal microbiome. It sounded easy enough and the thought of stewed apples, raisin and cinnamon just made my mouth water so I thought I’d give it a try! Notes: I substituted the handful of raisins in the original recipe for the Gula Melaka because I couldn’t find any preservative-free dried raisins in the local supermarket. Wash the apples, don’t peel the skins off them. If using non-organic apples, wash them with vinegar and baking soda to remove pesticides. Fill the pot with filtered water about 1/3 of the height of the apples. Bring it to a boil and cook for about 8-13 mins. You will know when it’s done when the skin of the apples gets a little shine/shimmer! The original recipe Dr.Tom mentioned called for 8-10 mins cooking time but I felt the apples weren’t cooked enough yet (still too crunchy) so I waited another 5 mins after which they were slightly softer and the flesh had changed from white to slightly yellowish. Dr.Tom further explains that the shimmer on the skins of the apples indicating its time to close the fire is a sign of the release of Pectins, the soluble fibre from inside the skin. By releasing it through cooking, this makes it easily accessible to the good bacteria and the lining of our guts, thereby promoting accelerated healing of the gut. Antiproliferative activity -stops cancer cells from spreading. Apples have potent antioxidant activity which can greatly inhibit the growth of liver cancer and colon cancer cells. Interestingly, “nearly all of the antioxidant activity from apples comes from a variety of other compounds”. This prevents DNA oxidation (damage). Do you have another simple, quick, healthy snack recipe I could try? Comment below! Next Post Achieving My 1st Back Lever! When is the best time to eat the apples? Great question! I guess it really depends on you, your goals and preferences. I like it as a dessert but others on the internet would recommend eating it before a meal (as with most fruits). What about making the apples more into a “sauce” I am wondering how that would work with the skin of the apple? I haven’t tried to be honest but I’m thinking it could work! Just keep simmering until the liquid is reduced.